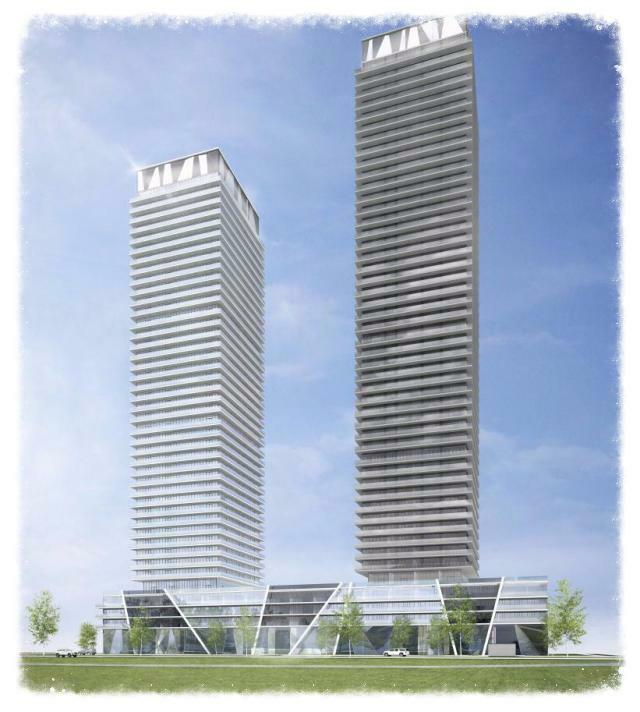 Mirabella Condos is a new mixed-use condominium development currently in pre-construction located at 1926 Lake Shore Boulevard West in Toronto, Ontario by Diamante Development Corporation. It consists of two 35 storey towers with 760 Residential Units in 2 phases of 380 Suites and Retail Mixed Use designed by Scott Shields Architects & Wayne Swardon. Interior Design: Stanley Kedzierski, Urban Parallel Interior Design + Planning. Phase 1 construction will start in Spring 2018 and Phase 1 tentative occupancy will be January 2021. 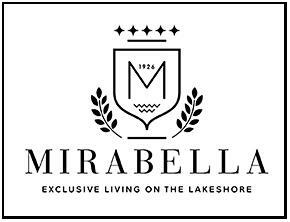 Mirabella Luxury Condominiums is a new proposed residential development on a 1.1 acre site situated at the corner of Lake Shore Boulevard West and Windermere Avenue in Toronto. This project consists of two phases with phase one being the east tower and phase two being the west tower. The proposal required the demolition of an existing five-storey hotel which has already been completed. The previous proposal was for two towers of 42 and 48 storeys in height connected by a four-storey podium with 847 dwelling units. The new proposal however, has been revised. The east tower decreased in height from 48 storeys to 35 storeys (120 metres). The west tower decreased in height from 42 storeys to 35 storeys (120 metres). There is a total of 760 proposed residential units consisting of one-bedroom to three-bedroom floor plans. Total gross floor area decreased from 65,825 square metres to 57,825 square metres. Parking spaces decreased from 835 to 755 vehicular spaces located below grade, ground level and in the podiums. Instead of a four-storey podium, the new proposal is now for a five-storey podium which will house residential units along the Lake Shore Boulevard West frontage of the Site with parking behind. An "appropriate façade treatment along the Windermere Avenue and Lake Shore Boulevard West frontages" will replace the residential units in podium levels 2, 3 and 4. The ground floor will house 315 square metres of non-residential use space for convenience retail purposes. A total of 2,575 square metres of outdoor amenity space is proposed to be located on the roof of the podium adjoining the two towers and directly accessible from the sixth floor indoor amenity areas. A total of 1,694 square metres of indoor amenity space is proposed to be located at ground level of the podium and at the sixth floor of the two towers. 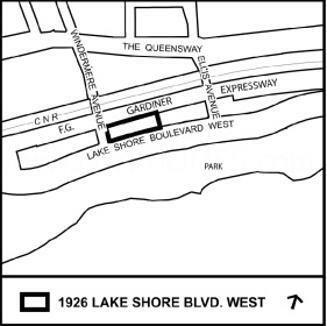 "There are two existing driveways from Lake Shore Boulevard West which are proposed to be slightly modified for the proposed development. The western driveway would lead to a circular drop off/pick up area within the ground floor of the building that would provide direct access to the two tower lobbies. Servicing and loading would also be within the ground floor of the proposed podium." Mirabella Condos is located near Sunnyside Beach by the Gardiner Expressway on the former site of the Four Points by Sheraton Hotel. Located south of The Queensway and the High Park-Swansea neighbourhood and the High Park Zoo. Diamante presents grand living on the shores of Toronto’s glorious waterfront. This once in a lifetime site is nestled between the majestic High Park and beautiful Lake Ontario - just ten minutes away from Bay Street, yet Mirabella is a world away from the congestion of downtown. The project’s grand condominium suites and amenities will enjoy "Forever Views to the Lake and Park". Located in an oasis of inspired amenities, residents will enjoy immediate access to the Martin Goodman trail, High Park and Lake Ontario. Residences will have an executive work centre for working "at home" and children will have a custom play area. Other amenities will include a pool, party room and exercise facilities and outdoor terraces and consignment garden. Register with us today for more information on the Mirabella Condos by Diamante Development Corporation! For more information, please register today for the Mirabella Condos. Rendering for previous proposal of 48 and 42 storey towers.